Click on thumbnails for hi-res, downloadable images. On a PC, right-click over larger image and choose "Save Picture As…" to save locally. For a MAC, click and hold over the image, choose "Download Image to disk" (Internet Explorer) or "Save This Image As …" (Netscape) to save locally. 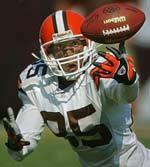 John Beale, Pittsburgh Post-Gazette, "Facemask," Cleveland Browns at Pittsburgh Steelers, January 5, 2003. 2nd Place Bob Rosato, Sports Illustrated, "Flying Fish," New Orleans Saints at Miami Dolphins, August 15, 2002. 3rd Place Ed Suba, Jr., Akron Beacon Journal, "All Thumb," Kansas City Chiefs at Cleveland Browns, September 8, 2002. Honorable Mention Michael C. Hebert, New Orleans Saints, "Breaking the Plane," New Orleans Saints at Atlanta Falcons, November 17, 2002. Honorable Mention Jerry Lodriguss, Philadelphia Inquirer, "Akers Dives," Dallas Cowboys at Philadelphia Eagles, September 22, 2002. Honorable Mention Jim Prisching, Chicago Tribune, "Eye Got It," Chicago Bears at Buffalo Bills, September 29, 2002. Honorable Mention David Silverman, New England Patriots, Untitled, New England Patriots at Chicago Bears, November 10, 2002. 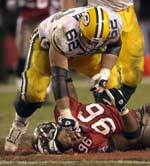 First Place Benny Sieu, Milwaukee Journal Sentinel, "Take That," Green Bay Packers at Tampa Bay Buccaneers, November 24, 2002. 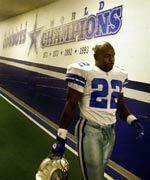 2nd Place Louis DeLuca, Dallas Morning News, "Exit A Legend," Carolina Panthers at Dallas Cowboys, October, 13, 2002. 3rd Place Boyzell Hosey, St. Petersburg Times, "Agony and Joy," Oakland Raiders vs. Tampa Bay Buccaneers (Super Bowl XXXVII), January 26, 2003. Honorable Mention Jeff Bayer, San Francisco 49ers, "Signature Moment," San Francisco 49ers at Seattle Seahawks, October 14, 2002. Honorable Mention Wally Skalij, Los Angeles Times, "Pre-Game Prayer," Tennessee Titans at Oakland Raiders (AFC Championship Game), January 19, 2003. 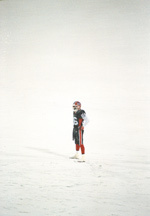 Honorable Mention Thomas Aquinas Wolf, Buffalo Bills, "Alone In The Storm," Miami Dolphins at Buffalo Bills, December 1, 2002. Honorable Mention Gene Sweeny, Jr., Baltimore Sun, "Make Believe," Cleveland Browns at Baltimore Ravens, December 22, 2002.